Galvanised Steel Ladder for easier access. The JumpKing ladder is easy to fit - it just hooks on the frame over the outer circular metal rail. Our ladders are suitable not only for JumpKing Trampolines, but for all 10, 12 and 14 foot diameter round trampolines. Our Trampoline Ladders are suitable for all circular 10ft, 12ft & 14ft Trampolines, as well as rectangular & oval-shaped trampolines. Trampoline ladders can be very useful, especially to help younger children to get up the trampoline, and protect their parents' backs (by avoiding having to lift their child on and off all the time). Another advantage of a trampoline ladder is that it can help protect the pads since, without a ladder, children often grab onto the front of the inner ring of pads in order to get onto the trampoline, which pulls the pads off the trampoline in a way for which they are not usually designed. 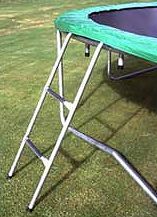 A stool or upturned box can be used instead of a ladder, so they are not essential, however, in our opinion, trampoline ladders do look more elegant. JumpKing Trampolines accessories offer some of the latest advances in trampoline design at very affordable prices.